Corel, online at Corel.com, is one of the top software companies in the world. Their easy to use and powerful software allows consumers to improve productivity and enhance their lifestyles. Whether you want to make a movie, edit photos, play a DVD, compress a file, or create a document, Corel software has an option for you. If you want to try before you buy, Corel offers free trials on all of their software. They also offer a variety of free tip and tricks to help you use their software to its full potential. Don’t forget to take a look at the best Corel discounts, Corel promotions, and Corel coupon codes from RetailSteal.com. Corel ships orders to the 50 states via FedEx, starting at $9 for ground shipping. Corel offers a 30-day money back guarantee, excluding shipping. Visit merchant’s website for full details and exclusions. Enjoy a 40% discount on your purchase of MediaOne Plus from Corel when you shop today. Click link to save. Get free shipping and $60 off the Photo and Video Pro Bundle online at Corel Corporation. Click link to save. 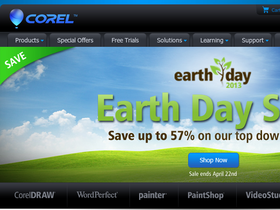 Use this coupon code on Corel to save $45 on WordPerfect Office X5. Sign up to receive emails from Corel today and enjoy a$15 discount on your next purchase. Spend $99 or more on Corel.com and they'll ship you your order for free with this coupon code. Click link to check out the special offers from Corel.com. You can save up to 30% on top software including Painter 11, WinDVD Pro 2010, Corel® WordPerfect® Office X5, and more. Save $160 on Corel Painter 11 exclusively from Corel. Save $50 on Corel's Painter Essentials 4. Click link to check it out. Save $30 on Corel's WordPerfect Office X5. Click to save now! Save 20% on PaintShop ProX5 from Corel Corporation when you use this coupon code online. Enjoy a 10% discount on all purchases from Corel when you use our coupon code. Click the link to start shopping today. Use our coupon code online at Corel today and receive 20% savings on all software purchases. Save 60% on Creative Cloud from Adobe when you you're a student. Click to start saving. Shop at Adobe for educational and volume discounts. Click to save. Save 40% on Pro Creative Cloud when you shop at Adobe.com today. Click to start saving. Upgrade to Adobe Photoshop Elements 10 for only $120 from Adobe. Click here to begin. Save 40% on Creative Cloud membership when you switch from Final Cut Pro or Avid. Click to shop at Adobe for this limited time offer.